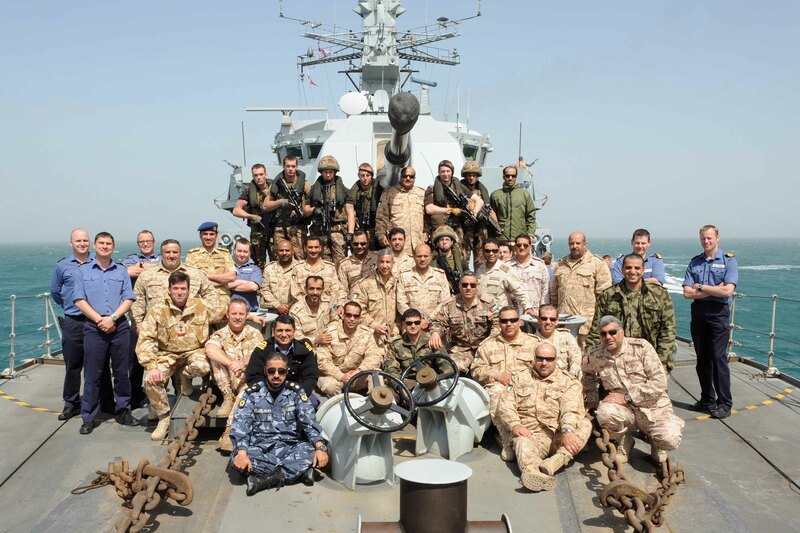 In a long-planned engagement, HMS Iron Duke visited Kuwait while on deployment in the Northern Arabian Gulf to play host to 90 students during Kuwait’s Joint Command and Staff College’s ‘Sea Days’. The event, which is a regular feature in the Staff College’s calendar, proved a chance for the Royal Navy to offer an insight into the military role at sea of a sophisticated warship. With the majority of the students having an air force or army background, the aim was to provide an interesting, first hand experience of the maritime environment with an understanding of HMS Iron Duke’s capability and operations. They were also given an overview of the role of British maritime forces in the Arabian Gulf. Students with members of the Ship's Company. The course visited the ship at the beginning of the Maritime Module, providing a practical exposure on which to underpin the theoretical lectures and discussions that would follow. Accompanied by their British and Kuwaiti Directing Staff, the students were given a series of demonstrations and briefings on how HMS Iron Duke and the Royal Navy conduct maritime business. The highlights included a boarding demonstration and an air defence exercise witnessed in both the Bridge and the Operations Room. 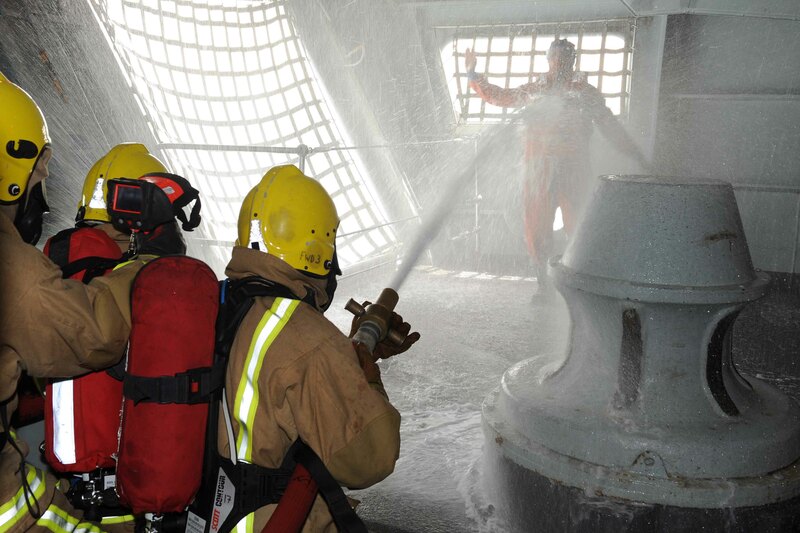 Other key events included a firefighting demonstration and tours of the ship’s engine rooms, galley and weapons systems. The Kuwait Mubarak Al Abdullah Joint Command and Staff College is a centre of excellence in the region with students from all three services mostly of the rank Major/Lieutenant Colonel and above. Its syllabus is modelled on its British equivalent, JSCSC Shrivenham, and teaches British-style doctrine. The College has 90 students from all three Services along with representatives of the Police and National Guard. Approximately a third of the College’s students are from outside Kuwait, predominantly from other Gulf States. 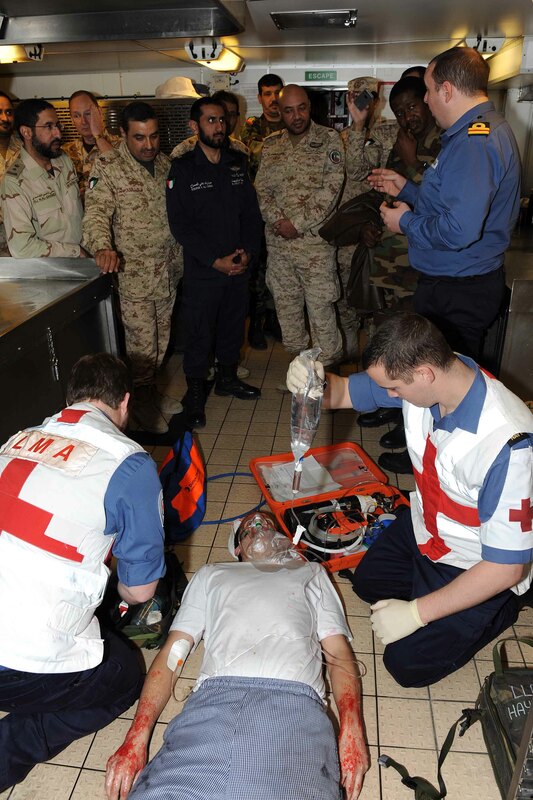 In addition to Kuwaiti officers, nationalities of Staff College students attending included Oman, UAE, Syria, Saudi Arabia, UK, Australia, USA, and Canada. HMS Iron Duke, a Type 23 Frigate, is on her first deployment to the Gulf. She sailed from her base port of Portsmouth in early January and passed through the Suez Canal at the end of that month. Since entering the region she worked with Combined Maritime Forces (CMF) in roles including counter-terrorism, counter-piracy and anti-human trafficking operations. She has also provided support to Iraq’s oil platforms, exercises and operations with regional naval forces and wider regional engagement to promote and support the UK’s interests in the area. Most recently she helped Kuwait celebrate the 20th Anniversary of her liberation following the 1990 invasion by Saddam Hussein. Since commissioning in 1992, Iron Duke has operated predominantly in the Caribbean and Atlantic, and in 2009 made the largest drugs seizure in RN history: 5.5 tonnes of pure cocaine with a value of over £240m.